Tough as Nails! Take this you slugs! If slugs seem to be winning the battle in your Hosta Garden, we recommend giving Hostas one more try. Hosta ‘Rhino Hide‘ is as tough as nails! The thick substance of ‘Rhino Hide‘ make this a real match for slugs. The extra thick leaves have extra wide blue margins with a splash of light green up the center. The leaves are cupped shape, giving this Hosta more dimensional look. Although ‘Rhino Hide‘ can withstand full sun, it is recommended that it be planted in a more part shade location. In mid summer watch for the white flowers to emerge. L.A. Dreamin’ Hydrangea is a brand new ‘can’t go wrong’ macrophylla Big Leaf Hydrangea. It offers the best of both worlds-blooms on new and old growth AND blooms both pink and blue with no soil altering! L.A.Dreamin’ is a very reliable bloomer, you start off by getting blooms from the previous seasons growth and then as new growth emerges, you will get blooms from the new growth. This also means that you will have a longer bloom cycle. Another REALLY cool feature of L.A. Dreamin’ is that it flower both pink & blue. This happens naturally on this plant and does not require any acid to turn the blooms blue. 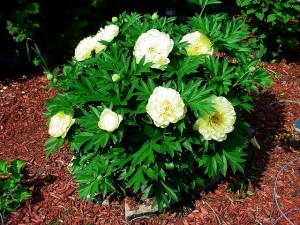 Standing 24″-30″ this compact bloomer does not require alot of valuable space in your garden. This mass when you think L.A Dreamin’, what a lovely sight it would be to have a whole border or garden full of the wonderful blue and pink flowers. Hydrangea also make for a wonderful cut or dried flower. Enjoy the beautiful blooms in a vase on your table or hang them to dry so you can enjoy them all season in a beautiful dried flower arrangement. No matter how you dream it, L.A. Dreamin’ is a sure bet dream come true! As a side note, as of this writing Garden Crossings is one of 2 companies to carry this exclusive variety for 2012. ‘Sun King’ Aralia makes you think a plant for sun… not so!!! This foliage plant is a shade gardeners dream come true, if for no other reason than just another choice. Standing 36 inches tall ‘Sun King’ could be used as a backdrop to your Heucheras and Hostas. Each branch has several chartreuse leaves that fan out for an airy garden look. In the late summer white flowers emerge that later turn into purple berries. ‘Sun King’ would also be a great center piece to a shade to part shade container garden, add in some Xtreme™ Impatiens or Bada Bing® Begonias for a constant summer color. You are currently browsing the archives for the 2012 New Varieties category.